April 12, 2019 Celebrate 20 Years with 20% Savings! Subscribe to be notified when product comes back in stock. 61267 left in stock, Hurry! This single patient use surgical skin marker has an ultra thin tip that won't clog and stays needle sharp, yet it is soft enough to insure patient safety. The ink is gentian violet, the only ink approved for use on human skin during any invasive procedure. It is non-sterile and aseptic. It should not come into contact with open skin or wound site and is intended for single patient use to eliminate any chances of cross-contamination. The pen cannot be autoclaved because it will melt and should be discarded after use. If you would like the dispensing box as shown in the gallery of images check out for 100 and the dispensing box will be included in your order. If you would like to easily display and hang the box in your studio, check out for the 4mm thick display to house and mount your new box of surgical skin markers. Removal: Remove with alcohol and a gentle scrub. It becomes a more permanent mark once it is allowed to dry. Non-sterile and aseptic: Cannot be autoclaved because it will melt. The barrel doesn't need to be sterilized because it shouldn't be coming into contact with the wound site. Eliminate cross-contamination: It is, as all pens like this are, intended for single patient use. The tip has never touched skin, so as long as it is single patient use, there is no chance for cross-contamination. The pen should be discarded or given to the client after use. Clean skin area thoroughly with an alcohol prep or swab. Dry the area completely. Carefully mark the cleaned skin area. Allow skin markings to dry. Prep normally over marked site. Use alcohol and a gentle scrub to remove markings. This listing is for 1 pen; however, if you check out for quantity 100 you will receive a box as shown in the gallery of images. 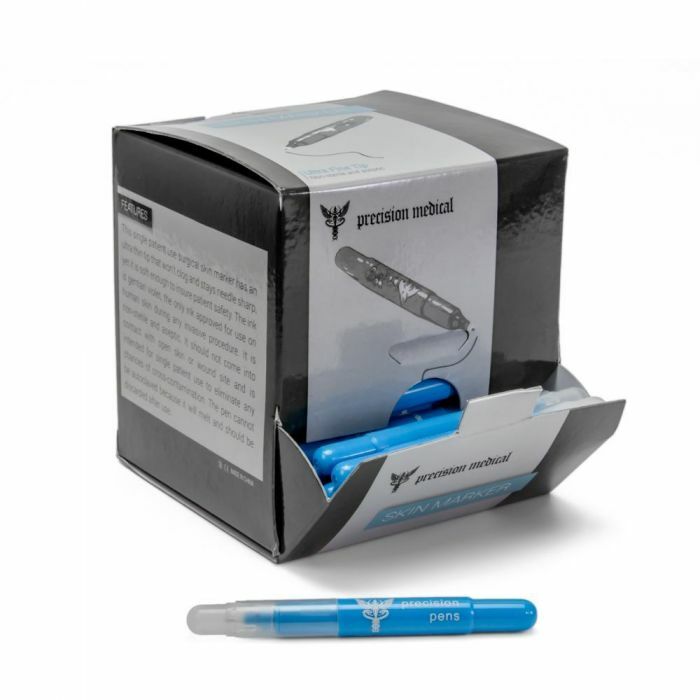 You can use this box with this 4mm thick display in order to hang and dispense your pens easily. The following webchart is a quick reference guide for standard body jewelry measurements and how to measure basic body jewelry. 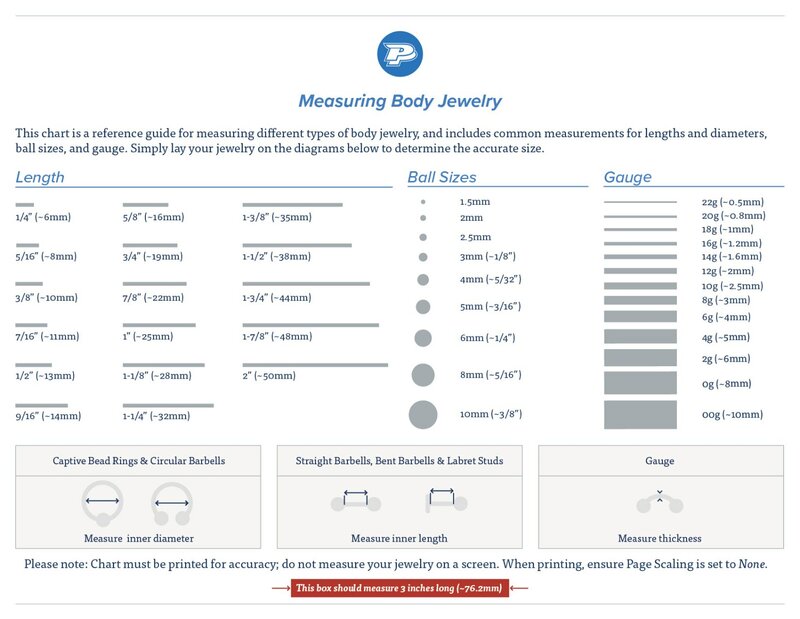 Please print this webchart to help measure your body jewelry accurately. Visit our PainfulPleasures Infocenter for additional body jewelry information. There, you will find detailed articles on standard body jewelry sizes, how to measure body jewelry, basic body jewelry, and more. Ensure compatibility between standard (non-custom) PainfulPleasures body jewelry parts using the tables below. More information on threading, including custom thread patterns, can be found in our Threading Infocenter article. Internally threaded jewelry has a threaded post on the top and/or end, which is then inserted into a threaded hole in the barbell shaft. Externally threaded jewelry has a threaded post on the barbell shaft, which is then inserted into a threaded hole in the top and/or end.